My chicken has become lethargic, not interested in treats like other chickens in flock. She also has a sagging comb that has gone pale and has developed black dots on it. I massage her throat and chest as they are really boated. Periodically I will gently hold her upside down to drain out dark fluid and residual food partials. She does like water. She also gurgles when drinking water and will weave and bob her neck/head as if to clear her throat or something. She has lost weight too. Help! She does look pretty rough. Sounds like you are doing good things for her. The gurgling sound is not good. You could try a baby aspirin mixed in her water. I'm hoping you have separated her from the flock. She needs to be kept warm. The gasses in her crop sound like "sour crop", a condition that can happen when too much bacteria and or yeast grows in the crop because it's not emptying fast enough. That could be her problem, or something more serious is going on and causing the sour crop. 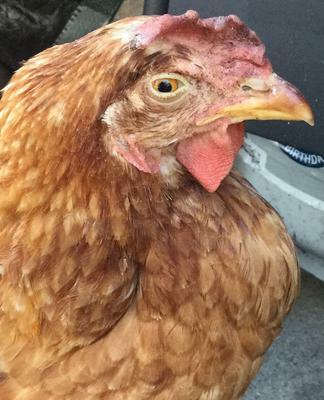 Once a chicken looks this ill, you need to support her as much as possible with fluids. You might try soaking some crumbled chicken feed, make it watery, mix a tablespoon of apple cider vinegar (raw is best) with the mushy feed. The vinegar can help balance out her crop bacteria. When she finishes that I would recommend a mush with live culture yogurt(no sugar)or with probiotics. Not knowing her age, not sure what to tell you about her chances of getting through this. If young, she has a much better chance. If you can get her to eat any dark leafy lettuces or grasses, this will help, but try to avoid breads and high starch foods. Her drooping comb is a sign that her blood pressure is low, so I imagine her body temperature is low, too. A heat lamp available to her would be good. Don't force her to be near it, but make it available so she can warm up as needed. She might benefit from an injection of antibiotics, or oral but that is hard to say. I couldn't tell you which one to try. Chickens try to appear strong and healthy, even when not feeling well. By the time they look and act sick, they are struggling to survive. Hope this helps and you can pull her through.